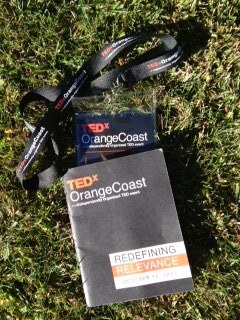 I had high hopes for the 2012 TEDx Orange Coast since 2011’s inaugural conference rocked. This year’s theme was Redefining Relevance, a challenge we face across socioeconomic strata. Attending a TED Talk in Long Beach, California now costs $7,500 per person, is by invite only and quickly sells out. The independently organized TEDx events are more accessible for most people. Although I left the October 10th conference feeling mixed about the day’s events, I did take away these interesting quotes from notable speakers. What is my innovation space? Your pain holds the key to your purpose. These are standalone quotes from people who could be at the country’s best cocktail party. How would you like your title to be “Catalyst”, “Global Strategist Pastor”, “Chief Scientific Officer”, or “Shadow Master?” Each speaker pitched how his or her work/life is a different interpretation of redefining relevance. Although this year’s speakers were less well known, they engaged more with the audience. My little brainscape did expand a bit. 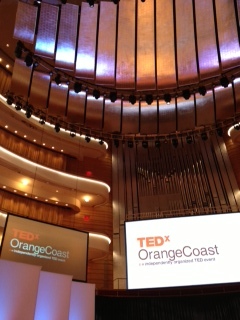 Completely organized by volunteers, TEDx are a noble effort to keep the mind stretching dialog going. Although I love ted.com like the other 2M monthly visitors, I also appreciate its gentle mockery from this hilarious Stuff That White People Like post. My hurdle is the attention required to keep the inspiring and innovative energy from TED Talks constantly swirling each day. Perhaps remembering and appropriating these quotes is one step in that direction. Perhaps it is less Redefining Relevance and more Keep Defining Relevance.